What Can be Done to Educate Others and Stop Homophobia? Image provided by Florida Department of Health 'Man-Up' Initiative. As we know from a 2010 public opinion poll, 52 percent of Americans believed that gay and lesbian relationships were acceptable, while 43 percent of Americans who participated believed that gay and lesbian relationships are morally wrong. (1) (2) (6) The Southern states of America are much less tolerant of homosexuality than areas where there is a strong and established gay scene, for example New York City and San Francisco. (3) Within the African-American and Latino cultures, homosexuality is seen as even more taboo and is generally not discussed leading to homophobia and discrimination. For this reason, we must do more to overcome homophobia, stigma and discrimination to improve the health of everyone, especially young black and Latino MSM. To help tackle homophobia close to home, it requires members from all communities to get involved. A few ways to participate are by hanging and distributing some of our awareness posters about this educational project throughout the community in which you live. When others view these posters it will hopefully lead them to this website where they can read more information on this important issue and discover some of the things they can do to help stop discrimination and most importantly the spread of HIV. There are many ways to get involved to support gay and lesbian people living in your community. Visit our POSTERS page to download, print and distribute the awareness posters throughout your community. Share the information and knowledge you have with others. 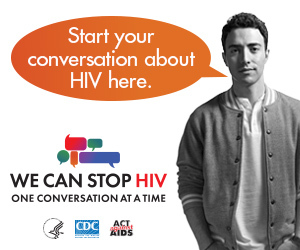 Start the discussion to reduce stigma and discrimination in your community! In other words...BREAK THE SILENCE! Marsha Ambrosius devotes the music video for her new single "Far Away" to raise awareness against bullying. Inspired by her real-life experience, the clip revolves around a gay black man who is bullied and treated as an outsider by people in his neighborhood due to his sexual orientation. At the end of her video, Marsha sends out the message below to others, along with a number you can call if you need to talk with someone. Every year over 1 million people commit SUICIDE. Some were BULLIED because of their SEXUALITY. I lost a friend to SUICIDE, and I’m asking all of you to support alternative lifestyles. Don’t put up with or join in with BULLYING. It’s time we become more aware in this WORLD. Take responsibility to make a difference. So if my music can save one life, I’ve done my job. Marsha Ambrosius music video "Far Away"
If you see someone being discriminated against or bullied, stand up for them, say something, and stop the spread of hate! People who harass LGBT people often get away with it because no one speaks up to stop the verbal abuse being said and this just perpetrates the abusive cycle to happen over and over. Violence often happens against people who are most marginalized within a society, specifically someone an abuser feels like he/she can attack without repercussions. If you witness this kind of verbal abuse, harassment, or physical violence you have the power to stop it by intervening, or calling someone in the community who can help. Always report abuse and violence that happen in your community to put a stop to all forms of discrimination. There are very few LGBT centers within the black community that provide support and care. You can open your community center, home, apartment or personal business to provide a meeting and/or social space for people to find comfort and support in their own community. As humans, we have more similarities than differences. In the end, we all want the same things...we all want to be happy. Everyone deserves to live a life free from abuse and violence. If we practice this mentality of care and support to everyone within our communities, we will begin to see an end to much of the violence that happens and occurs all around us; not only against Black and other minority LGBT people, but also children, women, the elderly and other groups that are discriminated against.